It’s a little-known fact that the Spanish city of León’s name coincidentally means “lion” in modern Spanish; kind of like how Cork, Ireland, sounds like the word for the woody bottle stopper we put in wine bottles. Although this bustling provincial capital was founded as an encampment for Roman legions, the Latin name for this legionary town (Legio) converged with the word for lion (leo) over the centuries as Latin grew up and became Spanish. Apparently this distinction was also lost on the locals and a purple lion is now the city’s heraldic symbol. Cool! I was excited to finally get the chance to explore this city on a cold, drizzly long weekend back in March. Following the Camino de Santiago, but in reverse, I left my apartment in Santiago and caught the train east out toward the broad Castilian meseta, or central plateau. 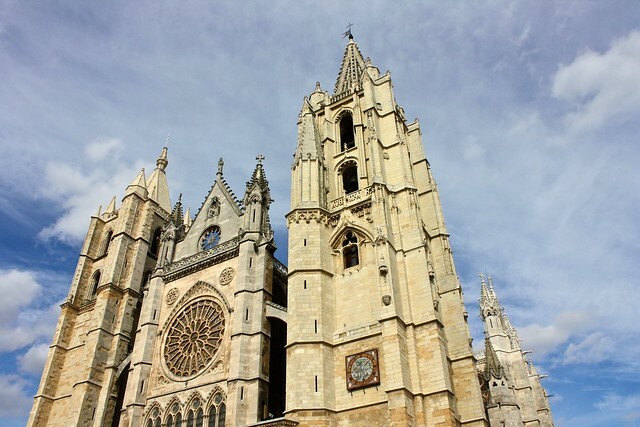 The last major stop along the French Way pilgrimage that ends in Santiago, León is rightly famous for its French-inspired Gothic cathedral. 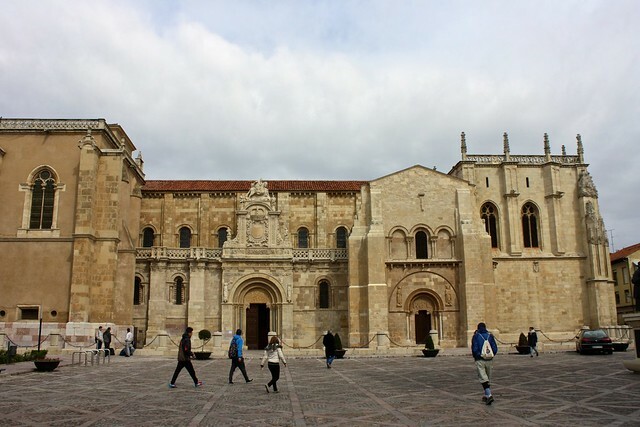 León is also a major university town—I know several American friends who studied abroad here—and a big center for getting free tapas with your drink order (read more at the blogs Gee, Cassandra and Restless Fork). Those bloggers have got the tapas action covered, so I’ll move on to other things (it’s worth mentioning, though, that my inner Texan did go wild over El Rebote’s jalapeño croquetas). My inner architecture and history nerds also enjoyed León for its rich heritage of buildings and churches that span half a millennium of styles. Read on to learn what this city has to offer. Built during the 1200s, León’s cathedral is surprisingly French in style. A huge rose window dominates the west façade, and the star of the show is the literal wall-to-wall stained glass that covers the entire upper story of the church. Massive panes span from the pointed arches up to the ceiling, giving the impression that the walls simply vanish into glorious light. The whole atmosphere is truly dazzling; when I first walked in, I was stopped in my tracks, smiling and taking it all in. The windows transform the usual gloomy gray stone interior into a reddish-purplish wonderland, refracting the pure sunlight into thousands of colors. 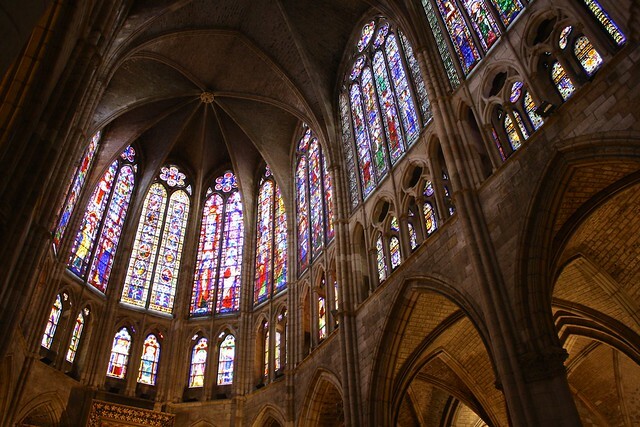 The whole church felt like Paris’s Sainte-Chapelle but on a much, much larger scale. 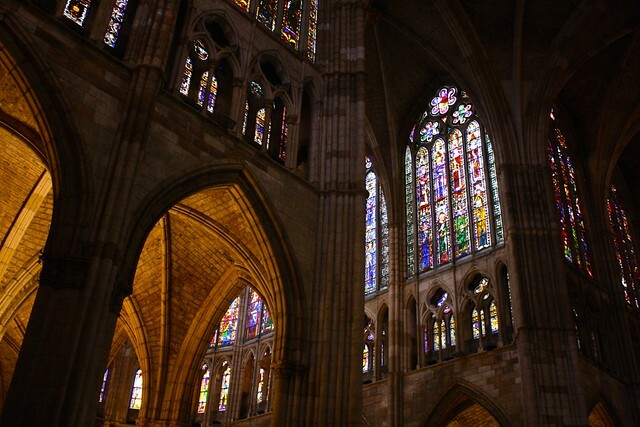 As if 1,800 square meters of stained glass wasn’t enough to put it on the map, León’s cathedral is also a perfect specimen of French-style High Gothic architecture. In the Middle Ages, the most popular itinerary to go on the Camino de Santiago pilgrimage was the camino francés—the “French Way” that traced 800km (500 miles) across the northern part of the peninsula, bringing pilgrims from all over Europe (and especially France). The Gothic style was called “the French work” in its time, so it’s not surprising, then, that the last major stop along the Camino would be home to such a cathedral. I’ve written a lot on this blog about the buildings that Catalan architect Antoni Gaudí designed during the turn of the century (read the intro to my Gaudí Week series). He mainly worked in his native Catalunya in northeast Spain, especially in Barcelona. However, most people don’t know that he accepted a few commissions in north-central Spain: two buildings in the province of León and another in Comillas along the Cantabrian coast. 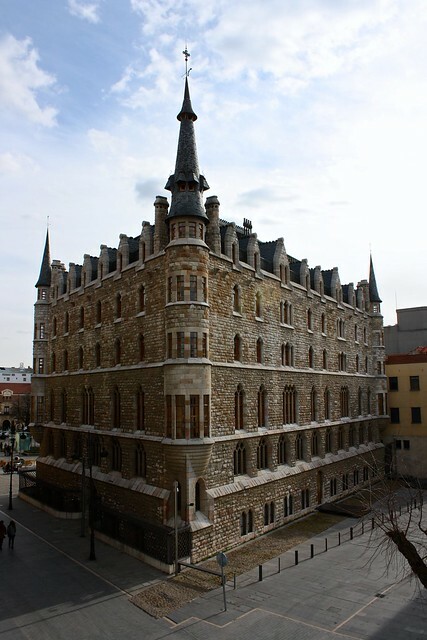 Built in 1894 as a warehouse/residence for Joan Homs i Botinàs and his company, the house was designed in the Neo-Gothic style popular in the Romantic era of the 1800s but it’s clear that Gaudí’s own personal interpretation of Modernisme/Art Nouveau couldn’t contain itself. The verticality and, uh, pointiness of Gothic Revival shows up in the slender, paired windows and round turretted corners, but Gaudí’s distinct signature adds some playful lobes to the pointed-arch windows and intersecting parabolas to the turret bases. 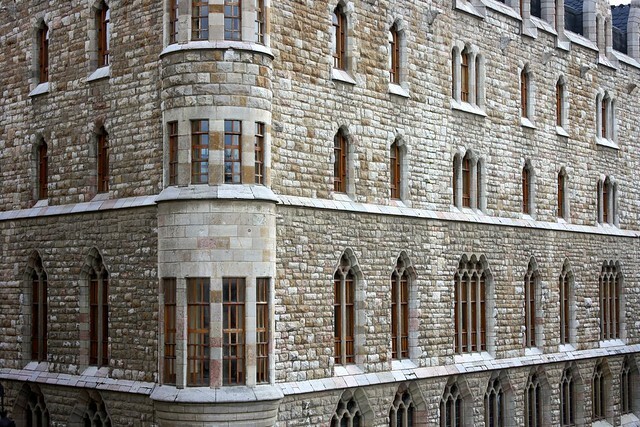 Today the house is owned by the bank Caja España, which puts on exhibits in the ground floor. If you walk over to the far-northwestern corner of the old Roman-walled town, you’ll end up at the Church of San Isidoro, one of the oldest Romanesque churches anywhere in Spain. Although it’s been spruced up over the centuries—the whole east section was torn down and rebuilt in the Late Gothic style—the church looks generally as it would have a thousand years ago. 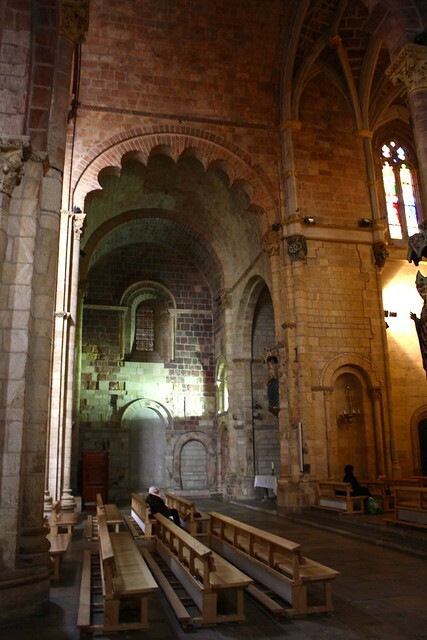 On the south façade, you can admire two Romanesque tympanums (the sculptures in the round semicircle above the doors), and within there are some unique lobed arches that look like they belong more in Moorish Andalucía than in northern Spain. The church is dedicated to St. Isidore, an important Visigothic Christian scholar whose remains were moved from Muslim Ishbiliya (Sevilla) up here in the Middle Ages. 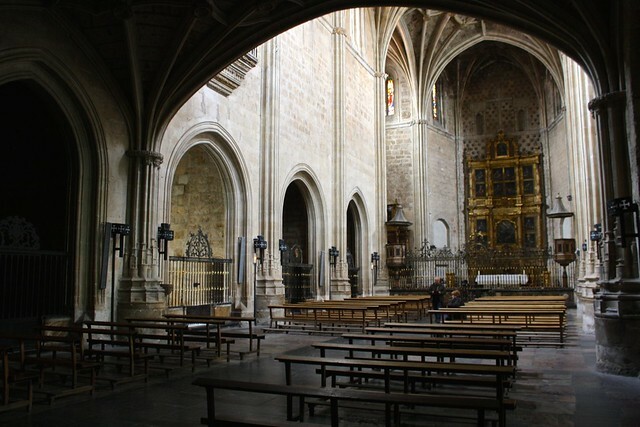 If you sign up with a guided tour, you can go underground and explore the Panteón de los Reyes, the royal burial place for dozens of kings and queens who ruled the medieval Kingdom of León. Their plain sarcophaguses aren’t really interesting—it’s what’s above your head that is really amazing. 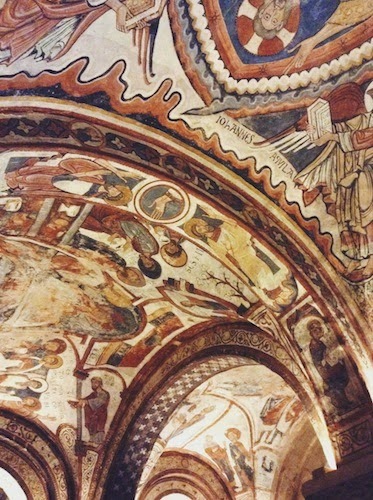 Covering the entire ceiling are bright, thousand-year-old frescoes that represent biblical scenes, the four evangelists, and even an illustrated agricultural calendar. You’re not allowed to take pictures down there…but I snuck one in anyways! 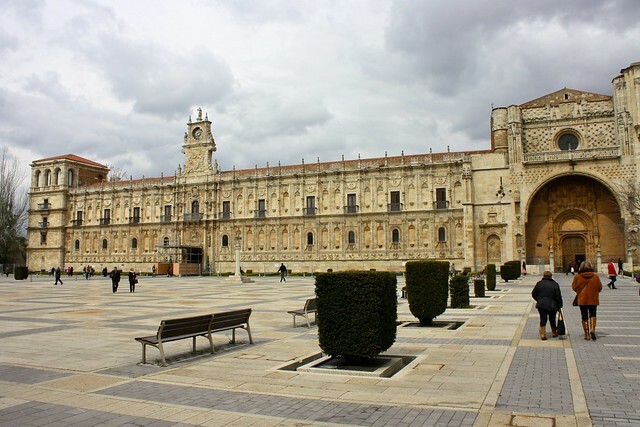 León’s parador or fancy state-run hotel on the northern edge of town occupies a stately 500-year-old former monastery, the Convento de San Marcos. It was designed in the Plateresque style, which means the intricate stonework, shells, and sculptures on the façade look like they were forged by silversmiths, or plateros in Spanish. This architectural movement was unique to Spain and was kind of a transition style between Gothic and Renaissance. A perhaps morbid factoid about this building: during the Spanish Civil War, it served as a concentration camp for Franco’s Nationalists. Although most of this huge building is off-limits to the plebes non-hotel guests, you can check out a small museum as well as the functioning church, which was built in the Gothic style and has some side-chapels that you are free to walk around in. If you’ve been to León before, what else does the city have to offer besides great architecture? Which of these buildings most interests you? Tell me what you think below in the comments!